A kind statue with a stone beard watches over the spirit of a nation. In mainland Chinese history books and in temples across the country, the master presents a humble visage, crossing his hands before his chest (a highest etiquette showing respect) ready to preach his thoughts. Yet the latest scholarly research, both overseas and here in China, suggests Confucius (551-479 BC), or Kong Zi (kǒng zǐ 孔子) to Chinese, is a victim of much misunderstanding or at the very least was a man of multiple personalities. 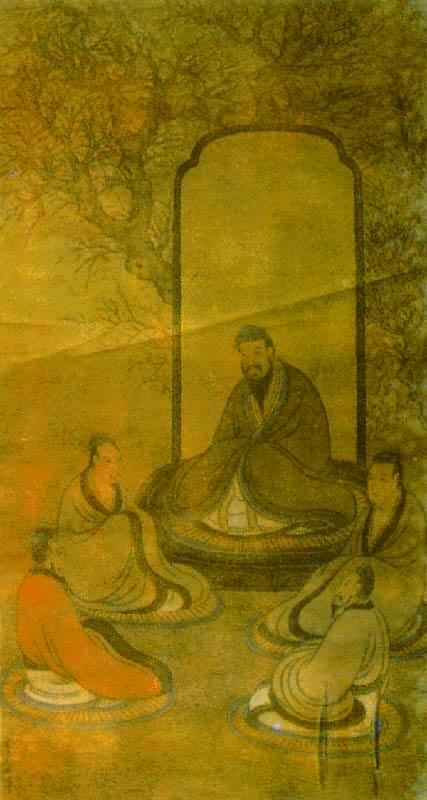 Confucius' reputation in mainland China was pulled off the altar and onto the floor during the "Cultural Revolution," (wén huà dà gé mìng 文化大革命) (1966-1976), though the strength of his influence on Chinese culture today suggests the sage was well protected in the hearts of the Chinese people through those troubled times. Overseas, his reputation continues to accrue foreign converts willing to emphasize the positives. This year, the fourth Confucius Institute was set up in Maryland, USA, following those in Seoul, Stockholm and the Uzbekistan capital of Tashkent. "He proved to be a teacher of rare enthusiasm and skill," writes the American scholar Leften Stavros Stavrianos in A Global History: From Prehistory to the 21st Century. "Surviving records describe him as an attractive and magnetic person - sensible, kindhearted, distressed by the folly of his age, convinced that he could restore tranquility, and blessed with a saving sense of humor." Two thousands years have made it interminably difficult to separate the fact of the man from the fiction. Thus it remains wise to regard much of what is known of him as mythical. Though the grim, strict Confucius is image maintained in the minds of many Chinese, historical records suggest a much more congenial fellow than his severe statue belies: a progressive humanitarian who opposed slavery and advocated meritocracy, both revolutionary ideas of their time. 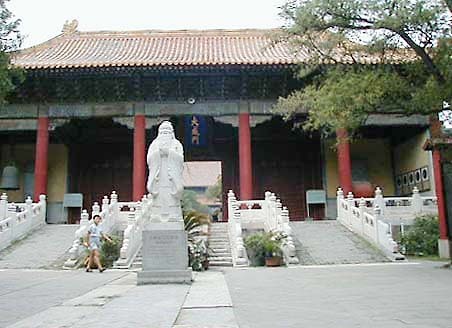 With over 3,000 students, Confucius was the first man in China to open the gates of knowledge to a wider populace. "Those who can present ten pieces of dried meat can be my student," he said. Although not every family could prepare such a gift for the teacher, it was a giant step forward to suggest that young aristocrats were not the only people deserving of knowledge. Here was a philosopher played the ancient Chinese qin (stringed zither) nearly every day, excepting funeral days. And his lessons were not dull. He debated issues with his students and encouraged them to question freely at class. Dozens of his disciples ended up becoming famous in the fields of politics, philosophy, literature and diplomacy. Confucius himself yearned to be much more than a scholar or educator. He yearned for a chance to put his political ideals and philosophical ideas to the test, for a ruler to hire him as a government adviser. In pursuing this ambition, he went from pillar to post. In 517 BC, the 35-year-old Confucius pleaded with the advisers to the Kingdom of Qi, a strong and prosperous kingdom near his motherland, the Kingdom of Lu. But King Qi Jinggong turned him down. A frustrated Confucius returned home. His opportunity came 16 years later. At the age of 51, Confucius was appointed as Minister of Public Works and then Minister of Crime by Lu Ding Gong. But Confucius apparently offended members of the Lu nobility and was forced into exile. In the company of his disciples, Confucius left Lu and traveled in the states of Wei, Song, Chen, Cai, and Chu, purportedly looking for a ruler who might employ him but meeting instead with indifference and, occasionally, severe hardship and danger. In 484 BC, the 68-year-old Confucius returned to his country to organize the Book of Songs, the Book of Documents in Spring and Autumn Periods and other ancient classics. His enthusiasm for politics cooled. Many Chinese scholars attribute Confucius' failure to the times in which he lived. The Eastern Zhou (dōng zhōu 东周) (770-256 BC) was a declining and decentralizing society. The ruler of the country had lost influence over his vassals. The political institutions appeared to have almost completely broken down. On the other hand, that also made it a time for great intellectual fermentation and creativity. Under these anarchic conditions, Confucius' teachings were far from being generally accepted, let alone applied. But his frustrated attempts to spread his views hardly seemed to render Confucius a cynic. In one story, Confucius and his followers were surrounded and imprisoned by soldiers in Fuhan, a disorderly place frequently at war. They were running out of food. Hungry and exhausted, many fell sick. But Confucius remained optimistic, playing his qin and singing along with other students. Some students were offended by his apparently happy-go-lucky antics. "Why choose to suffer in misery?" replied Confucius. "Is there something wrong about our philosophy?" This behavior reflected his idealism and belief in each and every individual seeking to achieve his fullest potential virtue, regardless of any ugly interfering realities. The student's response is equally revealing of the sage's unfailing idealism and heady personality: "My teacher, your ideal is so high that it cannot be consistent with reality everywhere. However, you don't give up your efforts to realize it. What does it matter whether your ideal is accepted or not? It was only four hundred years after his death that Confucius attained unprecedented respect. Emperor Han Wudi (156-87 BC) found his teachings useful in sustaining a proper and orderly society and ordered Confucianism become the official creed of the nation. 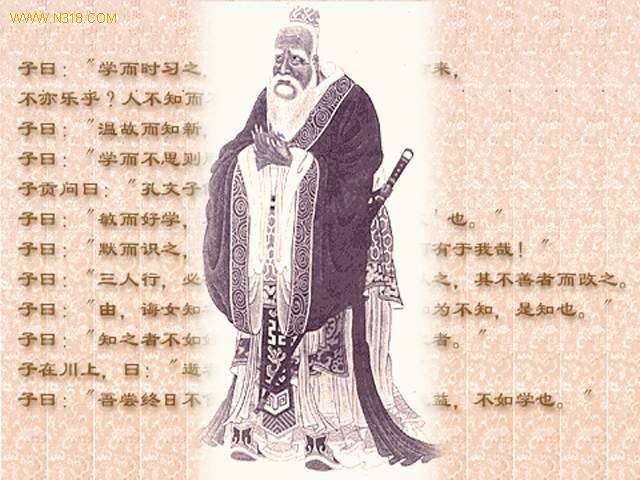 Confucius's teachings were well adapted to the stability and cohesion of Song Dynasty (960-1279) feudal civilization, according to Zhu Xi (zhū xī 朱熹), the most famous philosopher at that time. Confucius emphasized ethical principles. Just as the individual should be subordinate to the family, so the family should be subordinate to the emperor. The natural obedience of the lower order appealed to those at the top. Confucius was idolized and his thoughts became mainstream orthodoxy for centuries. Scholars and statesmen still studied for exams before 1911. The collapse of the old imperial order that year opened a direct challenge to Confucianism. To many radicals and revolutionaries, China's backwardness was all too obviously associated with the great scholar's teachings. Out with the old and in with new. The debate about the true nature of Confucianism rages on through into the 21st century. "It (Confucianism) respects the old and belittles the young, respects the System and belittles reform. Thus it becomes quite a good tool for maintaining the status quo in various aspects, while excluding the possibility of making progress," writes Xu Yuanbo, a critic on Xinhuanet, echoing the views of Stavrianos. Meng Shaoyong, a Classical Chinese Literature doctoral student at Xibei University in Gansu Province, holds Stavrianos' views on Confucianism's negative qualities as more incisive than those of Chinese because of Stavrianos' position as an outsider. Meng believes Confucius still makes a lot of sense. "Actually, there's two sides to every story. Sometimes it's hard to say whether Confucianism was a blessing or a curse. Confucianism advocates peaces, humility, unity and harmony, while it also promotes obedience, conservatism and lack of aggression." Meng believes Confucianism even now is rooted in modern Chinese society. "Every nation has its character. It shouldn't be seen as simply a collection of backward thoughts." To others, Confucianism today will always remain out of touch with reality. "I hate the Analects I learned from my parents," says Wang Guanglin, 35, a salesman in the communication industry. "I was taught Confucius from childhood. But growing up in this society, I found these values couldn't help me survive the rat race. It took me three to five years to accept a set of new commercial values." The 28-year-old Liu Yan is a strong opponent to Confucius. "Confucius and Analects? Do you think it is important to instruct our behaviors? Now what we talk about are something about Zhou Jielun (one of the most popular Chinese singers), Yao Ming (a Shanghai native and an NBA player for Huston Rocket) and Hollywood blockbusters." The nineteen-year-old Fan Li replies.
" He set the law that women are the lowest from a family to a society. This idea was still live today, especially in many rural areas, where the boy has the priority to enjoy education in a poor family." Mainland ideas about Confucius tend to proceed from a Marxist "mode-of-production" point of view. His teachings belonged to an agrarian, inward-looking society, quite at odds with China's ever-increasing role as an economic and political global power. But Zhang Fengrui, a Xi'an civil servant, believes Confucius retains relevance: “Be humble forever, because there is always someone who will come around the corner who is better than you. Be obedient to your leader, although sometimes his ideas are pure folly, because a really smart employee will never reveal that he is more intelligent than his boss. Be friendly and refrain from quarrelling with others because a good temper will benefit you by always getting help from people around you." Thus stands the statue in the new millennium. Love him or loathe him, praise him or criticize him, he's not going away. If, as the controversial political theorist Samuel Huntington states, the world is now entering a new phase of battling civilizations rather than nations, then the old man had better get that ruler ready. Some scholars are already prepared to throw the sage back into battle. Tang Yijie, a professor of Peking University, interprets Confucius as being all about "unity, but not conformity." Confucianism, he says, emphasizes humanity, peace, self-restraint based on ethical principles and tolerance of others. This, he feels, is an instructive attitude during a time in which China's rising status is forcing previously dominant western powers to reassess their world views. “Unity means not one side trying to destroy the other, or one side assimilating another," Tang says, "but trying to find common ground between two different civilizations and further promoting the development of each."